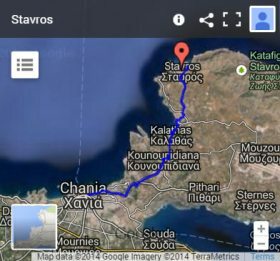 Stavros is a seaside resort located on the north coast of the peninsula of Akrotiri, in the prefecture of Chania, Crete. It is 15 km away from the city of Chania and it will take you about 25 minutes to get here. If you are thinking of staying here for your summer vacation, be aware that there is quietness, in general. Therefore, if the aim of your vacation is the serenity and tranquility, and if you like the place, choose to stay here. This place is mostly popular for the sheltered beach situated in a small cove on the northeast corner of the village. Unlike most of the beaches of northern Crete, which are affected by the north winds, this beach is sheltered, has shallow waters, is safe, truly ideal for kids. If you are visiting the prefecture of Chania with your children, then this is one of the beaches you should not miss, especially on windy days. So enjoy the sea and relax on the beach under the hot sun of Crete, while your children play in the water. On the beach, there is a canteen, and across the street as well as in other spots around the village, picturesque taverns by the sea, is there to serve your appetite. When you come here, maybe you happen to see taverns and hotels having the naming of Zorbas, something usual in many other places of Greece. The only difference is that this is not happening by chance here, because scenes of the famous "Zorba the Greek," starring Anthony Quinn, filmed in 1964. At the beach, and against the backdrop of the hill of Stavros, the Zorba danced the famous Sirtaki, in music of a Greek composer Mikis Theodorakis. So, this is Stavros, a quiet resort on the north coast of the Akrotiri peninsula, where apart from a few taverns, small hotels, rooms for rent, and a couple of supermarkets for the essential needs of your vacation, you won't find something else. In general, there is quietness during the day, with an exception on the windy days, when enough people come here for the sheltered beach. During the evenings, there is quietness also. Don't expect to see people strolling. Those staying here make their night out in the old town of Chania. Compare all the hotel booking sites in one search. View Hotelscombined in a new browser window.